Line structures will be the most common type of structural drawing you see in these pages. You will also see some others used for specific purposes, and those representations are explained here. Sometimes even drawing a line structure is too much. Proteins often contain thousands of atoms. Presenting all that information about bonding could make the drawing hard to read, especially in a three-dimensional shape. A picture of a molecule can be presented in several ways. A ball-and-stick model gives a pretty good idea of where all of the atoms are, and how they are connected. The balls represent tha atoms and the sticks represent the bonds. 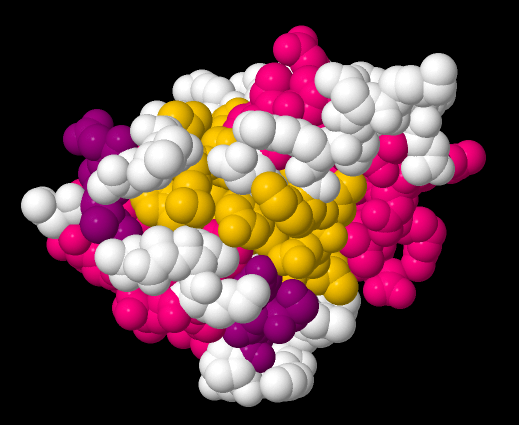 An example of a ball-and-stick picture of a protein, bovine low molecular weight protein tyrosyl phosphate, binding to inorganic phosphate, is shown below. Figure IM14.1. 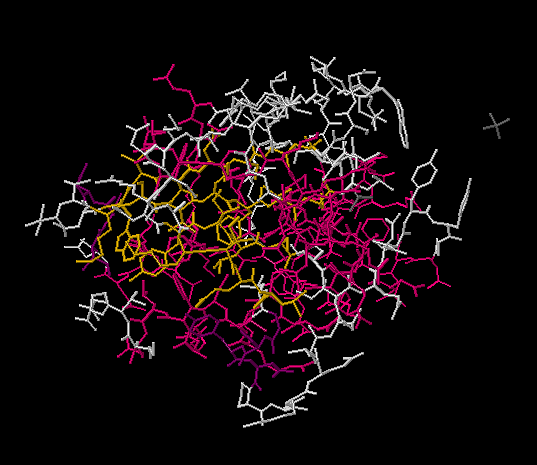 A ball-and-stick drawing of a protein, bovine low molecular weight protein tyrosyl phosphatase, binding to inorganic phosphate. Go to Animation IM14.1. 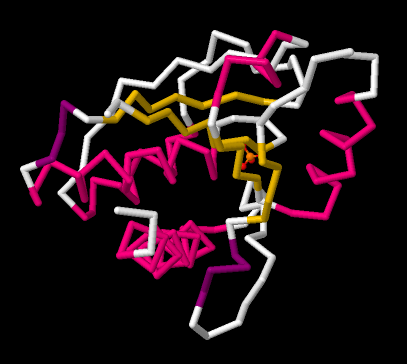 A three-dimensional model of bovine low molecular weight protein tyrosyl phosphatase, binding to inorganic phosphate. There are a couple of problems with viewing a protein this way, though. The first problem is that we usually don't know where the hydrogen atoms are, so they are missing from the ball-and-stick structure. Why is that? It's because protein structure is usually determined experimentally using X-ray crystallography. That means someone has gone to the trouble of isolating a pure sample of protein from an organism. They dissolved the protein very carefully, then coaxed the protein to form crystals. There are different ways to do that, but usually it involves cooling the solution, so that the solvent no longer has enough energy to keep all of the molecules dissolved, or else evaporating a little of the solvent, so that there is no longer enough solvent to keep everything dissolved. This process might take weeks. At that point, they could carefully lift a single crystal out of the solution and mount in on an X-ray diffractometer. When X-rays shine through the crystal, they essentially bounce off the atoms and scatter in different directions. By measuring where the X-rays land, and using some computer software that exploits those imaginary numbers that you learned about in high school but didn't think were useful for anything, the researcher can determine the location of every atom in the molecule (if they get lucky). Hydrogen atoms are just too small to locate with any certainty, however. X-ray diffractometry can reveal the location of every atom in a molecule, other than hydrogen. X-ray diffractometry requires that the compound is crystalline. The other problem is that a ball-and-stick model of a protein contains an awful lot of atoms. The structure gets pretty complicated. The example here is a pretty small protein; its molecular weight is only about 35,000 D (D stands for Daltons; a Dalton is just another term for atomic mass unit or amu, but it is used more commonly in biochemistry and macromolecular chemistry). In larger proteins, its difficult to make sense of the pile of atoms we see in a ball-and-stick structure. Similarly, we could view the protein in a space-filling model. The space-filling model probably gives a better picture of what the molecule would look like in terms of how much room it would take up, or what its overall shape would be. The advantage of this view is that it allows a biochemist to see how other molecules might interact with the protein. For example, maybe a protein acts as an enzyme; it catalyses reactions that are essential for our survival. 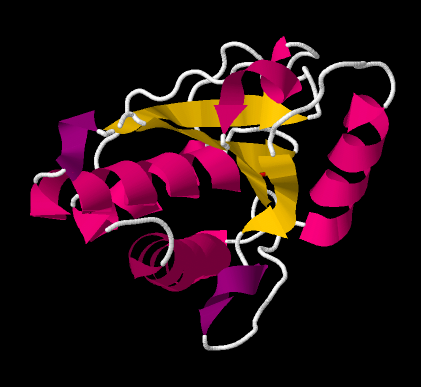 Bovine low molecular weight protein tyrosyl phosphatase is an example. It's bovine, which means it is found in cows. It's a phosphatase, which means it removes phosphate groups from other proteins. That is an important regulatory event in biochemistry. Adding a phosphate group or taking a phosphate group off another molecule, including another protein, often acts as an "on/off" switch, so that an organism can control when certain reactions take place. This is a tyrosyl phosphatase, so it specifically removes phosphate that has been added to a tyrosine residue in the substrate protein. By looking at the space-filling model, a biochemist may be able to see where the tyrosine from the substrate can fit into the bovine low molecular weight tyrosyl phosphatase, so that the enzyme can do its job and chop off the phosphate. The trouble is, most proteins look pretty much like blobs to the untrained eye. To make things a little easier, there are shortcuts that biochemists use when visualising proteins. Figure IM14.2. A space-filling drawing of bovine low molecular weight protein tyrosyl phosphatase with bound inorganic phosphate. One abbreviation used in biochemistry is sometimes called a wireframe structure. In a wireframe structure, none of the atoms are labeled and all of the hydrogens are omitted. That means it is difficult to tell a carbon from a nitrogen. However, biological macromolecules like DNA and proteins are made of a few simple building blocks. A very experienced reader would remember the structures of these building blocks. She would be able to tell what atoms go in which place based on the shapes of the building blocks. Figure IM14.3. A wireframe drawing of bovine low molecular weight protein tyrosyl phosphatase with bound inorganic phosphate. That's still a pretty complicated picture. There are other views that are simplified further. 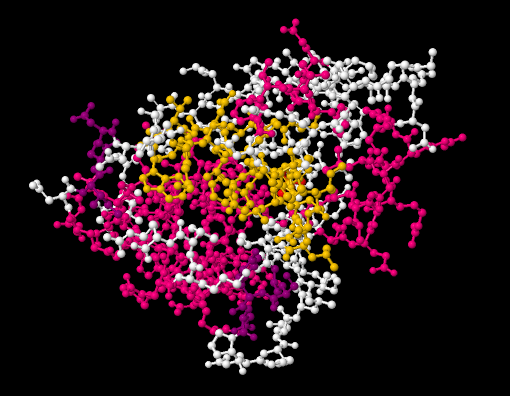 A protein is made of amino acids strung together in a chain. The chain does not hang out in a long, straight line. It folds up into a coil, and the shape of that coil influences its biological activity. Sometimes a biochemist may be interested in how the chain of amino acids coils up. A backbone structure only shows the atoms that are connected directly in a row from one end of the chain to the next. Any atoms that hang out along the sides of the chain are left off. Figure IM14.4. A backbone drawing of bovine low molecular weight protein tyrosyl phosphatase with bound inorganic phosphate. Those parts that were left off are pretty important in terms of the function of the protein. They are the parts that make alanine different from lysine, for example. However, if you are trying to see some basic shapes in the protein, they just end up getting in the way in the picture. The order in which a chain of amino acids is connected together is called the primary structure of a protein. For example, the amino acids glycine, alanine, tyrosone and arginine could be connected in the order gly-ala-tyr-arg, or ala-gly-arg-tyr, or tyr-gly-ala-arg, and so on. These compounds are isomers of each other. Knowing which isomer we have tells us something about the protein. The way that chain arranges itself is called the secondary structure. Very often, proteins coil up into spirals or helices. This helical structure is similar to that of DNA. Another possible secondary structure is a beta-sheet, which is sort of wavy, a bit like a sheet of corrugated steel. These secondary structures are held in place by hydrogen bonds between different amino acids. (You can see the structure-property relationship chapter to review hydrogen bonding). In the backbone drawing of bovine low molecular weight tyrosyl phosphatase, you can see where parts of the backbone are coiled up into alpha-helices. These parts are coded in pink in the picture. You can also see some sections that form pleated beta-sheets. Those are the yellow, zig-zag sections next to each other. Usually, the entire protein does not adopt the same secondary structure. There may be a section that coils into a helix and another section that forms a beta-sheet. The helical domain and the beta-sheet domain then arrange themselves and pack together somehow. The arrangement of domains in the protein is called tertiary structure. Figure IM14.5. A cartoon drawing of bovine low molecular weight protein tyrosyl phosphatase with bound inorganic phosphate. Seeing the tertiary structure in a protein can be difficult even with a backbone structure. Instead, ribbon drawings or cartoon structures are used to convey how beta-sheets and helices are arranged in a protein. Sometimes a protein is made of more than one chain of amino acids. The arrangement of different coils of amino acids all stuck together is called quaternary structure. Bovine low molecular weight tyrosyl phosphatase is a monomeric structure; it is just made of one protein chain, so we don't see a quaternary structure in this case.